If you’re an aspiring artist in possession of Apple’s latest and hottest tablet, the iPad Pro, along with the talent-inducing Apple Pencil, there is come great news for you. The popular and sought-after Astropad app for iPad has just been updated with some iPad Pro + Apple Pencil specific feature improvements giving the Apple-branded stylus a much finer ability when drawing. 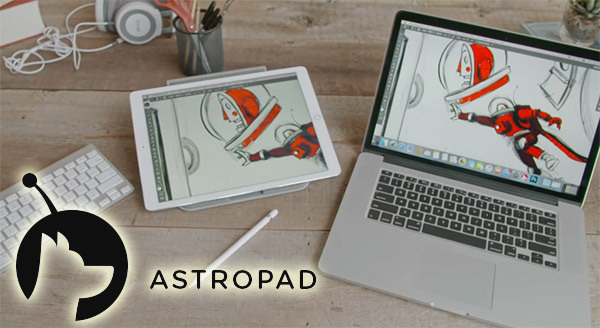 For those unaware of what purpose Astropad app actually does, it simply allows you to convert any compatible iPad into a dedicated professional graphics tablet, which can then be coupled with your Mac allowing you to draw directly in any compatible graphics app such as Photoshop. 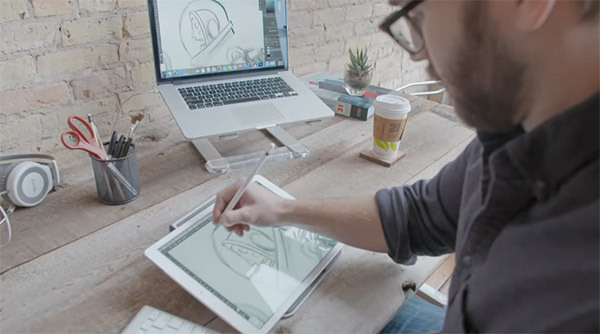 In short, it kind of converts iPads into Wacom tablets of sorts for your Mac. This ability has no doubt held its grip on but ultimately it did lack that fine control, which thanks to this recent update, is now possible with the Apple Pencil support coming into play. How fine you ask? For starters, the Apple Pencil can now be used as a sophisticated brush which means Astropad will now register the ‘Tilt’-ed stroke of the stylus allowing you to truly simulate a paint brush. We know that the Apple Pencil supports varying pressure levels across the iPad Pro’s display, and no Astropad update would be complete without supporting that, so the developer has now included a custom pressure curve within the app which should give users finer control over their strokes. Speaking of strokes, the update has improved the stroke quality while using the Apple Pencil, which means accidental marks will be far and few. While the app has supported the iPad Pro’s native resolution since the hardware’s release, the developer has further improved the in-app graphics on the iPad giving you much crisper results, and one would think that this could adversely affect the otherwise remarkable latency between the iPad and Mac that Astropad is famous for, but as it turns out, it doesn’t. So basically any input on the tablet, will be instantly translated onto the Mac running the graphics editing app. Sold to the idea? For those looking to experience Astropad for the first time, the app will now set you back a good $19.99 which is actually a pretty good price considering that it used to retail for $49.99 not so long ago. However for those who have already purchased the app, today’s update is entirely free, so what are you waiting for? The app is compatible with iOS 8.0 and above, and requires a Mac running OS X 10.9 or later.